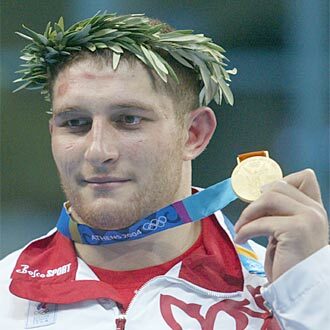 Outstanding Greco-Roman style wrestler, heavy weight. Olympic, World, European and Russian National champion. ATHENS, August 25 - The title of the Olympic Champion in the Men's Greco-Roman 120kg category is going back to Russia after 21-year-old Khasan BAROEV's (RUS) 4-2 victory over Georgiy TSURTSUMIA (KAZ). It would appear the 120kg category has found its new star as BAROEV is now reigning World Champion as well as Olympic Champion. Meanwhile, with two yellow cards in favor of him and one additional point in extension time, Rulon GARDNER (USA) won the bronze medal in the 120kg Greco-Roman category. 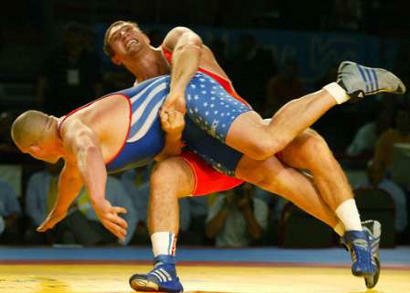 GARDNER, who became an overnight hero by beating legendary Aleksandr KARELIN (RUS) in the final in the 2000 Olympic Games in Sydney, said goodbye to his Wrestling career.